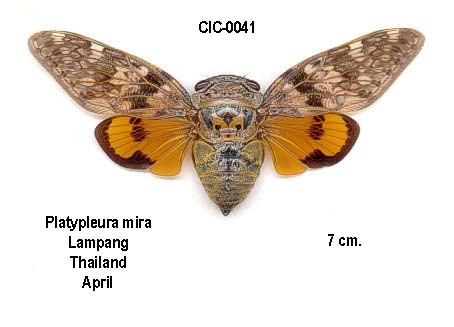 Megapomponia intermedia is a cicada found in Cambodia, Indonesia, Laos, Nepal, Malaysia, and Thailand. 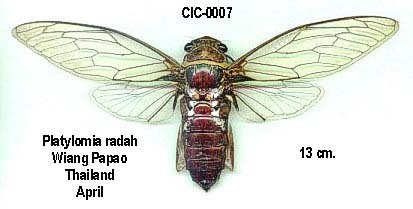 Note: the image reads Pomponia intermedia, but since the time the photograph was taken the name of the cicada has changed to Megapomponia intermedia. 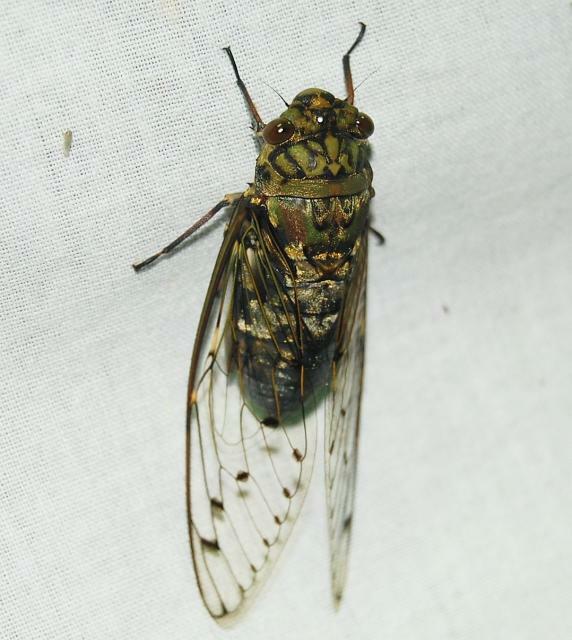 Note: the photo reads “Pomponia imperatoria”, but since the time of the photograph the name of the cicada has changed. Body above brownish-ochraceous, in some specimens castaneous. Head with a central longitudinal spot to the front, the area of the ocelli, a transverse spot behind eyes, and a spot at anterior angles of vertex, black. Pronotiim with two central longitudinal linear fasciae not extending beyond center — a central spot at the posterior margin — and the furrows black; posterior margin greenish, with two black spots on each side. Mesonotum with two obconical central spots, from the junction of which a longitudinal fascia extends to posterior margin, four spots in transverse series at the base, a spot on each lateral discal area, and sometimes some small spots at anterior margin black. Abdomen with the posterior margins of the abdominal segments narrowly black. Body beneath and legs brownish-ochraceous; transverse striations and the apex of the face, anterior tibiae, bases, and apical thirds of the intermediate tibiae, anterior and intermediate tarsi and the apex of the rostrum, black. Tegmina and wings pale hyaline, the venation ochraceous. Tegmina with the costal membrane and basal cell brownish or ochraceous, the claval area ochraceous or sanguineous; the transverse veins at the bases of the second, third, fifth, and seventh apical areas infuscated and a series of fuscous marginal spots at the apices of the longitudinal veins to apical areas. Wings with the base of claval area ochraceous or sanguineous; outer margin of claval area ochraceous. Long. excl. tegm. Male 46 to 68 millim. ; Female 41 to GO millim. Exp. tegm. Male 137 to 180 millim. ; Female, 145 to 216 millim. This is a most variable species, both as regards size and markings. 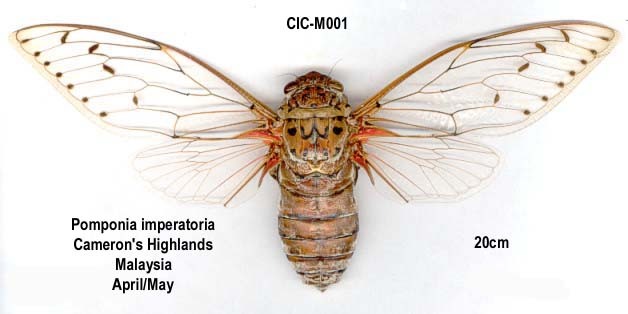 The largest specimen I have yet seen is a female in my o\vn collection from Perak, whose tegmina reach an expansion of 216 millim. 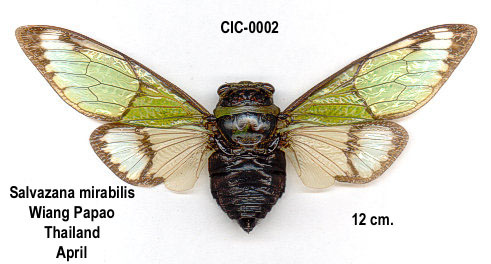 In some of the smaller specimens, the body is darker, and the markings to same and the spotting of the tegmina very indistinct. There almost seem to be two races of this species, one very much smaller and somewhat less prominently marked than the other. 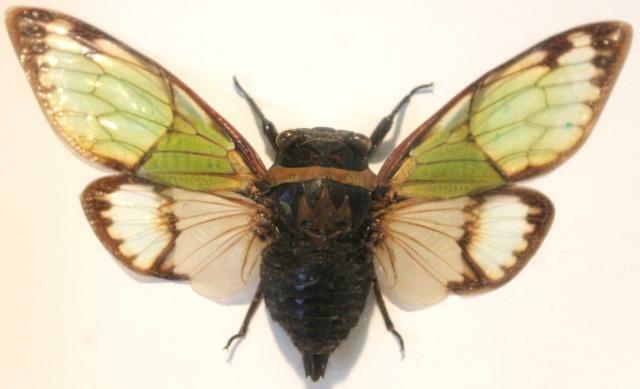 Pomponia dolosa is a cicada found in Thailand and Vietnam.